From ancient times to the present day, Iranian social, political, and economic life has been dramatically influenced by psychoactive agents. This book looks at the stimulants that, as put by a longtime resident of seventeenth-century Iran, Raphaël du Mans, provided Iranians with damagh, gave them a “kick,” got them into a good mood. 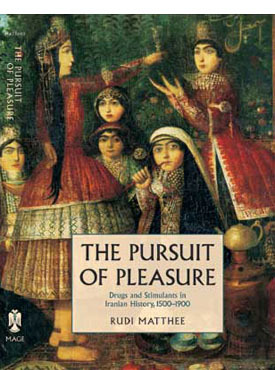 By tracing their historical trajectory and the role they played in early modern Iranian society (1500–1900), Rudi Matthee takes a major step in extending contemporary debates on the role of drugs and stimulants in shaping the modern West. At once panoramic and richly detailed, The Pursuit of Pleasure examines both the intoxicants known since ancient times—wine and opiates—and the stimulants introduced later—tobacco, coffee, and tea—from multiple angles. It brings together production, commerce, and consumption to reveal the forces behind the spread and popularity of these consumables, showing how Iranians adapted them to their own needs and tastes and integrated them into their everyday lives. Matthee further employs psychoactive substances as a portal for a set of broader issues in Iranian history—most notably, the tension between religious and secular leadership. Faced with reality, Iran’s Shi`i ulama turned a blind eye to drug use as long as it stayed indoors and did not threaten the social order. Much of this flexibility remains visible underneath the uncompromising exterior of the current Islamic Republic. Rudi Matthee is Professor of History at the University of Delaware. He is the author of The Politics of Trade in Safavid Iran: Silk for Silver, 1600–1730.